I first heard of Jim Collins back in the spring of 2009. I had just finished year one of a Ph.D. Physics program (which I left soon thereafter), and I was beginning to play around with computer programming. I wanted to make iPhone apps. The first book of Collins’ that I read was Good to Great. I distinctly remember reading that book into the late hours of the night in the basement-style offices to which we T.A.’s were relegated. And I loved it. It gave me stores of energy as I imagined being a successful entrepreneur in the world of app-making. Unfortunately (or maybe fortunately), I didn’t get the right people on the bus for that project. In fact, I didn’t even invite anyone else on the bus. My career as an iPhone app developer ended quickly (or so it seemed – more on that later). What I most appreciate about Collins’ work is his approach – he starts with a question, and then rather than coming up with his own answer and then seeing if he can prove or disprove it, he first takes an in-depth look at a large amount of data and then draws conclusions based solely on the data – NOT on his preconceived notions. 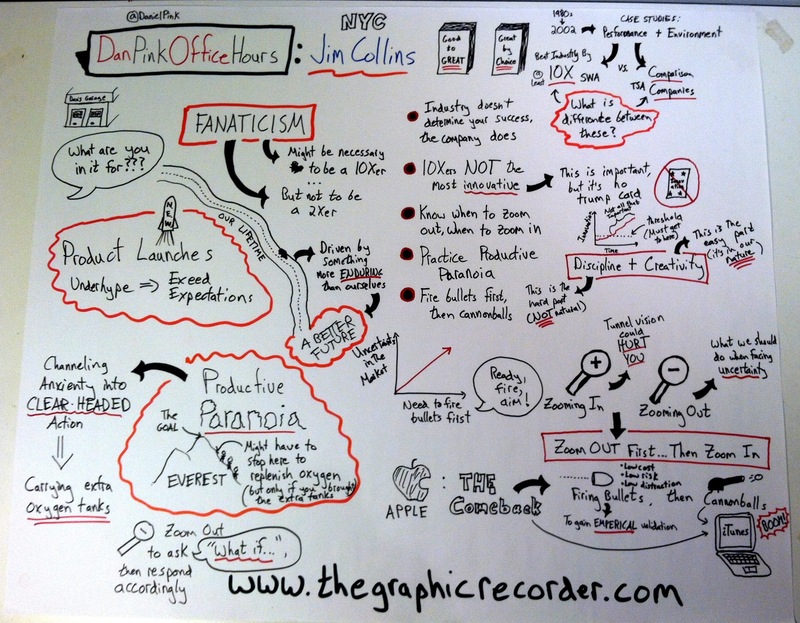 So a few weeks ago, when I saw that Collins had been a guest on Daniel Pink’s Office Hours, I jumped at the opportunity to take another shot at real-time graphic recording (see my first attempt here). In this chat with Daniel Pink, Collins discusses the factors that contribute to companies’ ability to outperform the market, in many cases by a considerable about. I encourage you to listen to the whole conversation and, while listening, explore the graphic above in depth. Here I will touch on just a few of the ideas that came out of that conversation, and why they are particularly relevant to me. 1) Between creativity and discipline, creativity really is the easy part. We have evolved to be creative, and once we give ourselves the necessary time and space, we have no problem utilizing our creative capacities. Discipline is the hard part. Through my experiences with creating apps, designing curriculum (I currently teach a high school statistics class), and capturing ideas visually, I have found that the creativity part comes naturally. When I give myself the space, the ideas come in floods, which is an exciting experience. The hard part is taking those ideas and having the discipline to put in the work to bring those ideas to life. For me, it is not necessarily the aspect of putting in work that is difficult, but rather deciding which ideas are worth the work (I might need to do more zooming out!). The situation I face right now is the following: I’m enjoying this experiment with graphic recording, but I’m not sure how to turn it into a career (or even if I really want to turn it into a career). That’s where the next step comes in. 2) Fire bullets, then cannonballs. The factors of low cost, low risk, and low distraction are the keys here. Right now my work life is spread out – I teach one online course, I work part-time as a computer programmer, and I substitute teach. That leaves a finite amount of time to explore graphic recording. I imagine that over the next year or so I will be firing a lot of graphic-recording-filled bullets to investigate potential ways to pursue this field and figure out how to direct it toward topics that are of interest to me and relevant on a broader scale (right now it is looking like that topic is education). I haven’t read Great by Choice yet, but I think I’ll be picking it up soon. In the meantime, it’s time to revisit Good to Great and see what new insights it will yield, nearly three years after first reading it.